Only a couple of decades ago, having a tattoo that couldn’t be hidden behind respectable job interview clothes was a pledge of allegiance to the unconventional. Merely appreciating the look of tattoos or wanting to pay homage to a person, subculture, or concept (like “freedom”) was not enough to warrant getting inked in a visible spot. You had to be indifferent to the possibility that certain employers—okay, most employers—might judge you as too rebellious or unprofessional to join the team. There’s a possibility, however, that attitudes have shifted, according to an analysis of recent salary data by a trio of researchers from the University of Miami and the University of Western Australia Business School. After gathering data from 2,000 participants, they found no evidence of a statistical difference in earnings or employment levels among the tattooed and the non-tattooed, and this held true whether a person had a few tattoos or many, and whether the tattoos were visible or not. Even the tiny percentage of survey respondents who had tattoos self-described as “offensive” did not show any signs of economic suffering for it. That said, a second recently published study, this one lead by a professor at Colorado State University, found that would-be hiring managers still don’t want to see tattoos on job candidates and will offer people with tattoos and body piercings lower starting salaries. The only exception: Those managers with more body piercings were less likely to hire someone who didn’t have any piercings or tattoos. It’s possible that these studies can be read as Rorschach tests: you’ll find your own bias—either toward tattoos or research methodologies—in your trust of one or the other. In the study that found no career penalty for the tattooed, which was published in the journal Human Relations, the researchers gathered information from participants recruited online. They argue that this crowdsourced approach—sometimes viewed as more representative of a population than a standard survey sample—makes the findings more telling than previous studies, which have typically found anti-tattoo sentiment among hiring managers through questionnaires, not by examining their practices. Although French and his team admit that tattoo acceptance may be skewed by industry, and that biases, therefore, may be masked within the data, they also hypothesize that as tattoos have become more fashion-statement than social-statement over the past twenty years, they’ve lost their edge in the eyes of recruiters. The Colorado State University paper, which found evidence of bias against tattoos, also differs from previous studies in that these authors presented both an image and a resume, in the form of a fake LinkedIn profile, to the evaluators they recruited. All of the 143 participants asked to play hiring managers had spent at least a year in a managerial position and had recently contributed to a hiring process at their place of employment. To control for variables other than tattoo and piercings allotment in the ersatz candidates, they first insured through preliminary surveys that the contenders were deemed equally qualified and attractive, and they limited the race, age, and gender of the participants to twenty-something-year-old caucasian women. All of the images came from a stock photography company, so admittedly the mock images may not have been convincing. A mock sales manager candidate. Through creative photoshopping, the images of the job hunters were modified. Some of the women were given either “mild” tattoos (a dolphin or a sun) or “extreme” designs (one job applicant had a dragon on her neck). Some were altered to have mild piercings (one nose ring), and others to wear more obvious face jewelry, like a spike in an eyebrow. Assuming the results are meaningful, it would appear that tattoos, even the sweet ones, have yet to shake their history as marks of the risk-taking and rule-flaunting. Tattoos generally did make it less likely that a person would be “hired.” The would-be hiring managers, who were tasked with filling the role of sales manager, also offered people with tattoos, or extreme body piercings, lower starting salaries. And the more extreme the tattoos, the less warm and competent the individual was seen to be. Applicants with either tattoos or piercings “were perceived as less committed than applicants without body art,” the authors write in the study, which was published by the Academy of Management . Participants who had more supervisory experience, however, were less likely to discriminate against body art. 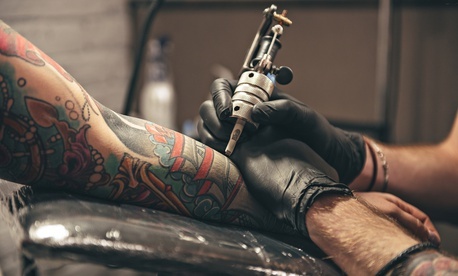 The authors speculate that they may have had enough experience with employees who had tattoos to avoid thinking in stereotypes.